In recent months the ECB has been dismissing reports showing declining inflation in the Eurozone. Officials have been calling the situation "transient". "Just wait until after Easter," and all will be well... (see story). 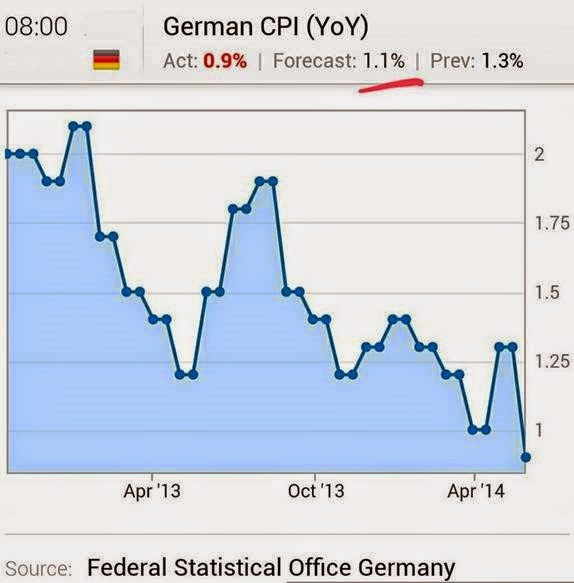 But today's inflation report out of Germany shows that there is nothing transient about euro area's disinflationary pressures. The ECB has little choice but to act at this point, and unless we see "shock and awe" from the central bank, global markets will be quite disappointed. On a related note, the chase for yield and the anticipation of fresh monetary stimulus in the Eurozone has created a rather distorted global rates environment. 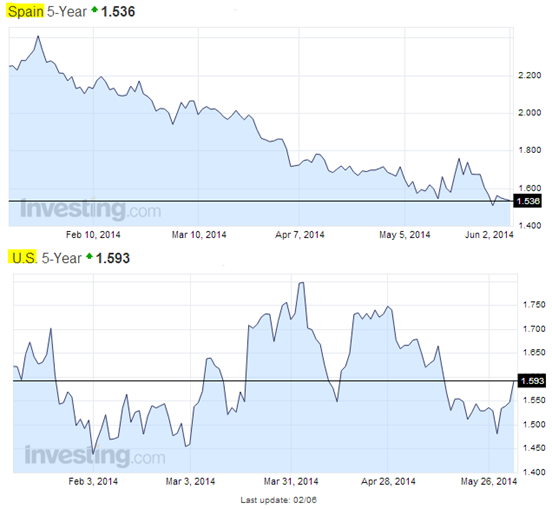 Spanish 5-yr government bond yield is now below the 5-yr treasury yield. Real (inflation-adjusted) yields in Spain are of course still higher than in the US. But just to put things into perspective, almost exactly 2 years ago Spain was staring down a potential collapse of its banking system and was actively seeking bailout funds (see post). Once again, without a "show of force" from the ECB, this is not going to end well.